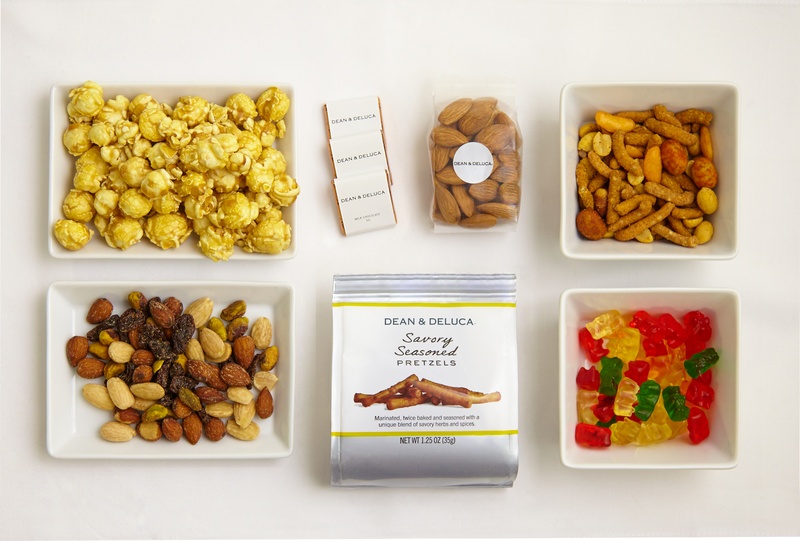 San Francisco – Virgin America, the California-based airline known for its award-winning menu, today announces a new partnership with Dean & DeLuca to bring the airline’s First Class flyers a curated selection of snacks in the sky including caramel popcorn, spicy Cajun snack mix, raw almonds and gummi bears. Renowned by epicureans across the country, Dean & DeLuca’s team of food experts has made it the company’s mission to find and provide the world’s best culinary treats for more than 35 years. Virgin America is also debuting an exclusive offering fromONEHOPE Wine – the label’s 2013 Chardonnay and Cabernet Sauvignon. Reflecting the palate changes that occur at altitude, both wines were chosen for their bold, fruit-forward flavors in Napa Valley during a joint selection process with Virgin America and ONEHOPE to choose the best options for travelers at 35,000 feet. 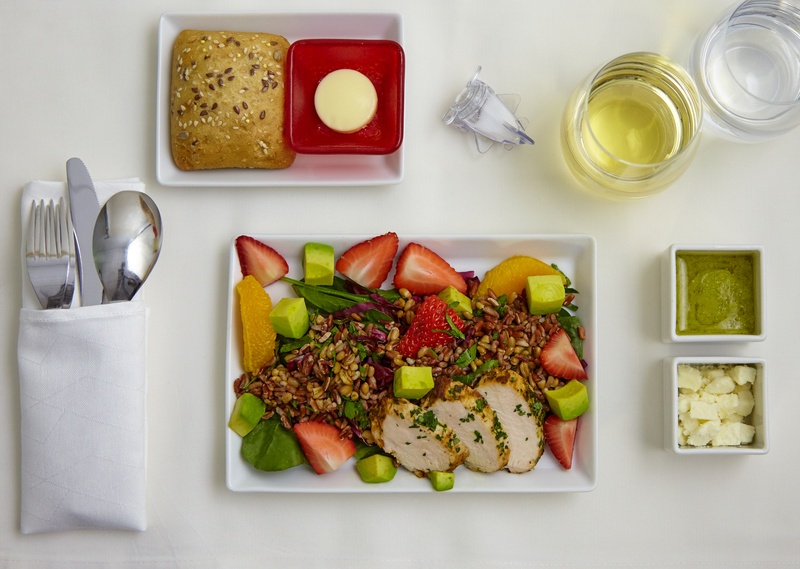 All of Virgin America’s menus are updated quarterly using an assortment of sustainable and fresh ingredients, including local fruits and vegetables, premium meats and artisan breads. Virgin America’s focus on a fresh, diverse range of menu options has helped the airline capture the “Best Domestic Airline for Food” award in Travel + Leisure 2014 World’s Best Awards. 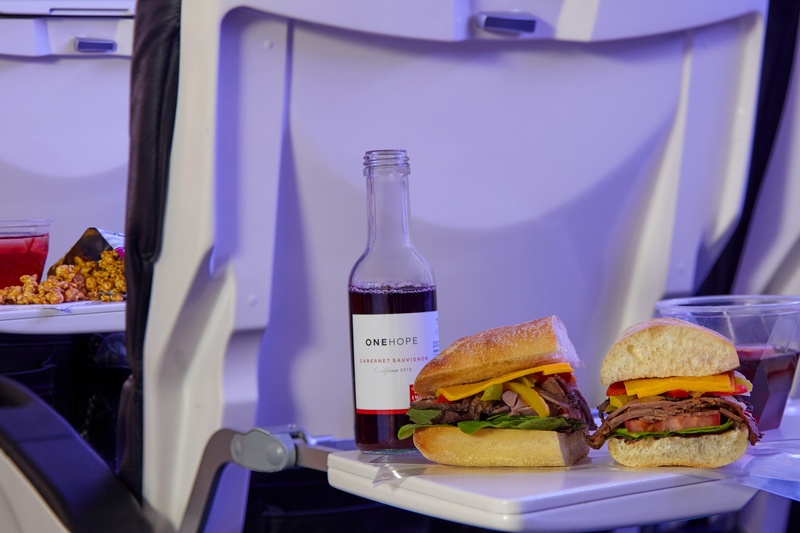 This summer brings big, bold flavors in First Class with entrées like the beef Bulgogi Bibimbap and hearty options like the roast beef and cheddar sandwich on ciabatta bread to Main Cabin guests who can order from their seatback any time during a flight with the airline’s Red® in-flight entertainment system. Red’s on-demand menu also includes an “open tab” feature that allows guests to swipe their card once and keep their tab open for continuous ordering during the flight. In addition to the specialty snacks from Dean & DeLuca, Virgin America has also refreshed its First Class amenities with plush, custom-designed duvets and pillows and an Autopilot Kit with eyeshades and earplugs. Jetset Kids Pack with fun, healthy snacks like Musselman’s Apple Sauce, Old Wisconsin’s Turkey Snack Stick, Yum Earth Fruit Snacks and Pirate’s Booty Aged White Cheddar. And for flyers 21-and-over, Virgin America is offering an exclusive selection of two wines fromONEHOPE Wine – a label that is produced in collaboration with Rob Mondavi, Jr. and has been awarded over 100 medals in local, national and international wine competitions. ONEHOPE Wine has also donated over $1.4 million to partner nonprofits and the 2013 Chardonnay and Cabernet Sauvignon are no exception – half of the profits from onboard sales will be donated to benefit women’s heart health outreach and education. The airline’s full summer menu is available here. Virgin America offers guests sleek, tech-forward aircraft cabins with custom-designed seating, fleetwide in-flight WiFi, signature moodlighting, power outlets near every seat and the Red® in-flight entertainment system. In addition to a Main Cabin that offers custom-designed leather seating with a deeper, more comfortable pitch, Virgin America’s First Class cabin offers plush white leather ‘cradle sleeper’ seating with 55 inches of pitch, 165 degrees of recline and lumbar massagers. The carrier’s Main Cabin Select service offers 38 inches of pitch, free food and cocktails, an all-access pass to media content, dedicated overhead bins and priority check-in/boarding. 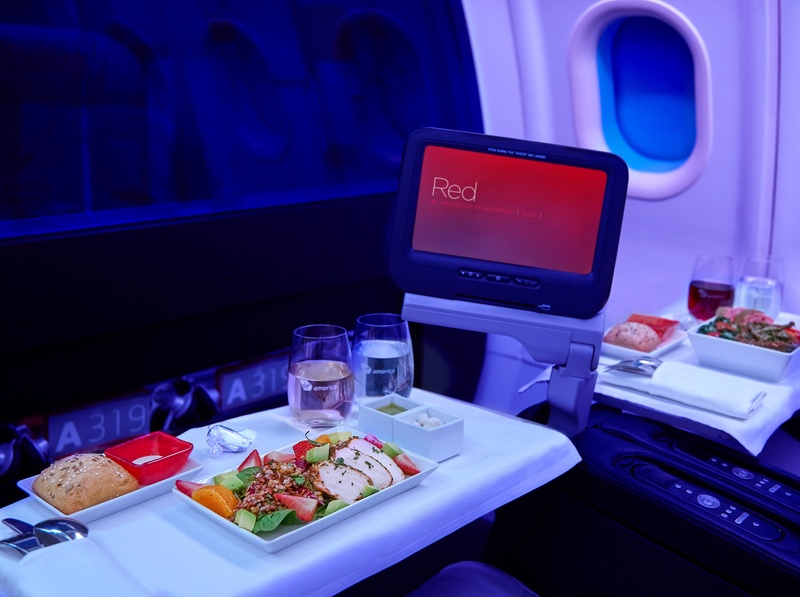 The Red in-flight entertainment platform offers guests their own seatback touch-screen TV, with more than 25 films, live TV, interactive Google Maps, videogames, a 3,000 song library and an on-demand menu, which allows flyers to order a cocktail or snack from their seatback any time during a flight. Red also includes an “open tab” feature that allows guests to swipe their card only once and keep their tab open for continuous ordering during the flight. Since its 2007 launch, Virgin America has expanded its network to include Austin, Boston, Cancun, Chicago, Dallas Love Field, Fort Lauderdale, Las Vegas, Los Angeles, Los Cabos, Newark, New York (JFK), LaGuardia Airport (LGA), Orlando, Palm Springs (seasonal), Portland, Puerto Vallarta, San Diego, San Francisco, Seattle, Washington D.C. (IAD and DCA), Honolulu (as of November 2, 2015) and Kahului, Maui (as of December 3, 2015). About Virgin America: Known for its mood-lit cabins, three beautifully designed classes of service and innovative fleetwide amenities — like touch-screen personal entertainment, WiFi and power outlets at every seat, Virgin America has built a loyal following of flyers and earned a host of awards since launching in 2007 — including being named both the “Best U.S. Airline” in Condé Nast Traveler Readers’ Choice Awards and “Best Domestic Airline” in Travel + Leisure World’s Best Awards for the past seven consecutive years. For more: www.virginamerica.com.